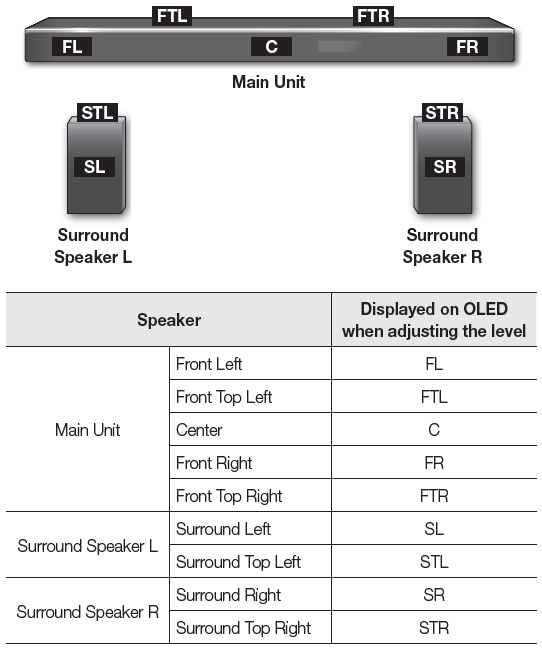 How do I adjust the volume for each speaker on HW-K950? The ATMOS soundbar has 5.1.4 channel sound. You can adjust the volume for each speaker. 1. To adjust the volume for a speaker, press LEVEL on the remote. 2. Select a speaker by pressing the Left or Right button on the remote. 3. Adjust the volume of a speaker by pressing the Up or Down button on the remote. How do I connect the subwoofer and surround speakers to HW-K950? HW-K950: How can I mount my 500W 5.1.4 Ch Dolby Atmos Soundbar HW-K950 to the wall? How can I control my HW-K950 with a Samsung TV remote?